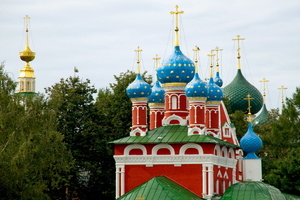 HOME » RIVER CRUISES » ST. PETERSBURG TO MOSCOW RIVER CRUISES » St. Petersburg - Moscow by MS "Prince Vladimir"
St.Petersburg created by Peter the Great to rival Venice, its 101 islands, 66 canals, and hundreds of bridges have secured its reputation as the most beautiful city in the country. While your ship is docked in port, you’ll enjoy daily sightseeing tours. You will see the Nevsky prospect’s shops, cafes and theatres, and you will tour the impressive St.Isaac’s, the city’s large cathedral, now a museum of elaborate icons and artworks. 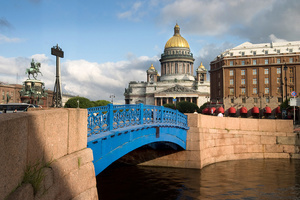 We will spend time in the world famous hermitage Museum, formerly the Winter Palace, home of the last six czars. A treasure trove of three million exhibits, its 320 halls display DaVincis, Rembrandts, Titians, Micheleangelos, French impressionists and North American artists. Brief description of what you will see during city tour *( outside view): Nevsky Prospect,Palace Square and Winter Palace+, Spit of the Vassilievsky Island, University Embankmant, Main Building of the State St.Petersburg University, Admiralty, Senat Square, Monument to Peter the Great (Bronze Horseman), St.Isaak's Cathedral and St.Isaak's Square, Field of Mars+ and Summer Gardens+, Cruiser Aurora, Smolny Cathedral. One of biggest museums of the world, founded 1764; its collection includes over 2.7 million items, including masterpieces of Leonardo da Vinci, Raphael, Roden, Rembrandt, Rubens, French impressionists, etc. Gala room of the Winter Palace, a former royal residence. The imperial summer residence on the Gulf of Finland, 29 km from the city. At the beginning of the 18th century palaces were built and parks with fountains laid under the order of Peter the Greate to commemorate the victory of the Russian army over the Sweden near Poltava. The highest fountain of Petrodvorets depicting Samaon (21 m) was built as a symbol of the victory 25 years after the battle.The tour of the BIG PALACE includes gala halls, residential rooms and suites. Here art pieces of the 18th and 19th centuries such as paintings, clocks, chandelles, dinners sets and decorative lacquer panels are displayed. Located 29 km south of St.-Petersburg. the construction of the Catherine the Great started in 1717. A park in the French style was laid out around it. In the middle of the 18th century Tsarskoye selo became the official royal residence. Not far from the Catherine’s palace there is the Lycem where the great poet Alexander Pushkin studied. The Lyceum is open for visitors. Green Stop.. 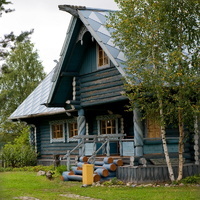 In the village there are some structures built according to the Russian fine traditions of wooden architecture. Village dwellers meet the quests and organize something special for them. There is a museum of Russian Vodka where tourists can get acquainted with the history of Russian vodka industry ( payment on the spot). Remeslennays Sloboda, walking in the picturesque woods. 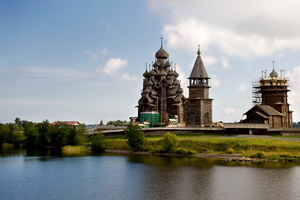 Via the Volga/Baltic canal, our cruise takes us to the tiny island of Kizhi, located at the northern end of lake Onega. Renowned for its open-air Museum of Architecture assembled from various areas of the country and restored to form a glimpse of the past. Founded in 1148, Uglich is one of the most beloved towns in old Russia. The view of the town as it is approached from the Volga River is especially lovely with the Cathedral of the Resurrection and St.John’s Church looming on the horizon.At the end of the 16th century, Maria Nagaya, seventh wife of Ivan the Terrible, lived in honorary exile in the Kremlin at Uglich. It was here in her garden that the Tsarevich Dmitry met his death and where the Church of St.Demitrius of the Blood was built and still stands today. Within the Kremlin is the oldest building in Uglich, the Palace of Tsarevich Dmitry. City tour: Stop at St. Sofia Embankment of the Moskva-river; The Bolshoy Stone Bridge; stops at Cathedral of Christ the Savior and Pushkin Museum of Fine Arts; the new monument to Peter the Great; Gorky Park; stop at New Maiden Convent; observation platform of Sparrow (Lenin) Hills; Viktory Park and Poklonnaya Hill with World War II Memorial; Kutuzov Avenue; White House. 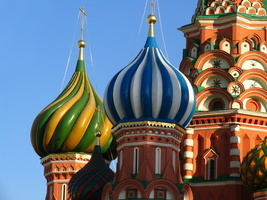 Kremlin & Cathedrals: The former residence of Russian czars, an architectural ensemble of unique beauty, which took shape between the 15-th and 20-th centuries. Cathedral Square - the center of the Kremlin with the 15-th century Assumption Cathedral, the main church of Russia, the 15-th century Annunciation Cathedral, the private church of Russian czars and the 16-th century Cathedral of the Archangel, the burial place of the czars. 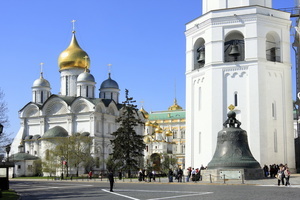 On the ground of the Kremlin there are famous Czar Cannon of the 16-th century and Czar Bell of the 18-th century. It is a national museum of Russian founded in 1856 by Peotr Tretyakov. The collection with its 100 thousand exhibits includes 5,000 works of ancient Russian art and world famous paintings by Russian and Soviet artists as well as sculptures and examples of graphic art. Photo stops at St. Sofia Embankment of the Moskva-river, the Bolshoy Stone Bridge; driving along the Cathedral of Christ the Savior, Pushkin Museum of Fine Arts, the new monument to Peter the Great; Gorky Park; photo stop at the New Maiden Convent; observation platform of Sparrow (Lenin) Hills; short stop at Poklonnaya (Bow) Hill with World War II Memorial; driving along Kutuzov Avenue; White House and the Kremlin; stop at the Red Square. During the Moscow by night excursion you will be taken to Moscow underground stations, make two or three rides and see four or five stations (the most beautiful ones). Each station was to be different from the others and designed in an original manner. The early lines opened in 1935 were the most successful in this respect. In the early fifties the luxuriously appointed and excessively decorated Circle line was built. The Komsomolskaya Station, serving the three railway station, is the most extreme, with its heavy gilt and ceiling mosaics depicting leaders on the mausoleum in Red Square. Three meals (breakfast, lunch and dinner) per day in the ship's restaurant with the same menu for all passengers irrespective of cabin category; meal service begins with dinner on day of embarkation and ends with breakfast on day of disembarkation. Full sightseeing programs in each of the ports of call, transfers upon arrival/departure. Tour of the ship’s bridge. Baggage: excess baggage, forwarding of baggage/ souvenirs.